Update ... after seeing the CAS Challenge for tomorrow ... I just couldn't wait. So here's my card for CAS161 - White with shades of blue. Hope you like. I stamped the large teacup in Marina Mist ink onto Bashful Blue cardstock. I cut the cup out and then sponged more Marina Mist onto the cup to darken it. I mounted the striped DP onto the Whisper White cardstock and wrapped the satin ribbon around, tying a knot just above center. I secured the knot in place with a glue dot. I paper pierced the top right corner of the card front and then mounted it to a card base of Marina Mist cardstock. I tied another bow from the White and silver ribbon and placed it on top of the blue knot, holding it in place with the pearl pin. I ran the tag die through my Big Shot with a small piece of Whisper White cardstock. I stamped the sentiment on the tag and added three small pearls below. I cut a piece of white Baker's twine and dyed it using the Marina Mist re-inker. Once it was dry I looped it through the tag and secured it to the back of the tea cup. 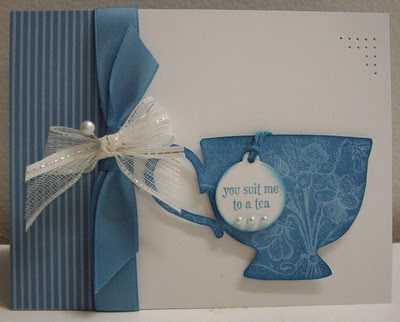 I mounted the teacup onto the front of the card using dimensionals to add depth. Today I'm in the studio with the Crafty Girls. We had a great time creating, chatting, laughing ... and, of course, eating. Fran brought Samosas for lunch and Deb brought Coconut buns for dessert - delicious - thanks to both of you! I didn't organize a workshop for them today ... it was more just find cards that I've made the you like, and make your own version. It was fun, relaxed and, in the end, they all went home with three lovely cards each. We had fun experimenting with some more of my new Memory Box die-cuts. Here's my card from today, using the Breezy Wreath die-cut ... decorated with flowers made from the Wildflower Patch die-cut and the Itty Bitty flower punch. Hope you like. I ran the Wild Wasabi DP (polka-dot) through my Big Shot with the Breezy Wreath die-cut twice. I used one as my base and cut the other into individual leaf sprigs. I punched three itty bitty flowers from the Poppy Parade DP and shaped them using the mat pack and stylus; I set them aside. I ran the Wildflower Patch die-cut through my Big Shot three times, twice with Daffodil Delight cardstock and once with Tangerine Tango cardstock (I would have used Poppy Parade cardstock but didn't have any). I cut the flower heads from the stems of the wildflowers and shaped them using the mat pat and stylus. I used three of the small flowers as centers for the Itty Bitty flowers. I then just randomly glued the flowers and leaf sprigs around the wreath until I felt it was balanced. 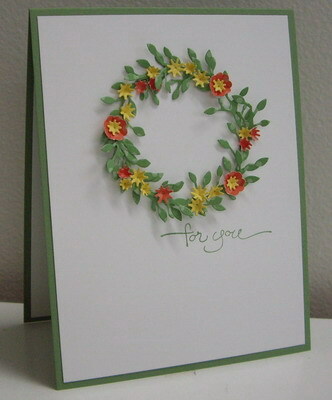 I dry-fit the wreath onto my Whisper White card front to determine the placement for the sentiment. I removed the wreath and stamped the sentiment in Wild Wasabi ink. I mounted the card front onto a card base of Wild Wasabi cardstock. I cut a dimensional into small pieces and added them to the back of the wreath and then mounted the wreath onto the card front. Labels: CAS, friendship, paper piercing, poppy stamps, Stampin' Up!